Jenn here. It's been a month since we launched our new upgrade and pledge system using PledgeManager. Hopefully unbeknownst to you, I've been helping out with the customer support. Before we (re)launched I was totally dreading it. You hear all this stuff about customers always being right and demanding all kinds of outrageous things. I was also nervous because I know how many backers there are and I imagined thousands of customer support emails clogging up my inbox. It turns out everyone's been just lovely! For the most part the system has worked pretty well and hasn't needed much work from me. So hugs all around and thanks for making my job easy. Why do you need more money? Didn't you get a bunch of money from the Kickstarter already? Yes and we're using that to make the basic version of the game and all the stretch goals. But we want to make Thimbleweed Park even better by adding more art, more animation, more sound, more music. We need your help to make Thimbleweed Park even more amazing. But wait, will that mean the scope and development time are increasing significantly? No way! Many of our team are only working part-time right now. Your money will allow us to pay them for more of their time, which means more great stuff gets put in the game. It's not about adding new scenes, new puzzles or new features, it's about polish, polish, polish! It's about special case animations and more music variety. All the stuff that will make Thimbleweed Park blow you away. I never got an email about all this PledgeManager stuff you're talking about! I want to be part of the party! If you're not sure which link to click or you're still not seeing your rewards properly, email us at support@terribletoybox.com and we'll get you sorted. I paid with PayPal, but PledgeManager still says I owe money! What's up with that? It turned out that for a while PledgeManager and PayPal didn't talk to each other properly. Something about email addresses or not having physical addresses. Thankfully the wonderful PledgeManager people assure me they tracked down the problem and so no one should have any issues from now on. However, if you were affected by this, get in touch via support@terribletoybox.com. Let us know the email addresses you used with PledgeManager and PayPal and we'll make sure your account reflects what you actually paid. I backed the phone book during the Kickstarter, but I never got an email about how to enter my voicemail message. I want my reward!! We sent out emails at the start of February. If that email's been lost forever in spam or otherwise, let us know via support@terribletoybox.com and we'll resend your email. I'm a new backer/backed after the Kickstarter, can I get the phone book? On our Kickstarter page, we said that the Phone Book was a Kickstarter exclusive. While we could say that what we meant was that the price was exclusive and allow new people to get the phone book, we don't feel that's in line with what our Kickstarter backers thought we meant. So in order to be true to our promise to those backers, we can't let non-Kickstarter backers get the phone book. Sorry. We've learned our lesson. I'm a Kickstarter backer and I upgraded to get the phone book now or I bought another phone book as an add on, where do I enter in my information and record my voicemail message? You'll receive an email from us with all the details on how to put in your information. We've had a delay sending out those emails, but they will be going out soon. That email will also tell you your unique phone number in the game, so you can leave a message to call a friend if you want. We'll be extending the deadline on when the phone book voicemail messages need to be finished by. So don't worry, you'll have plenty of time to get it right. So keep your eyes peeled for an email us. I pledged twice with the same email, but PledgeManager doesn't show me all my stuff and I didn't get a second Phone Book email. Give me my stuff!!! You pledged twice?! First off, YOU'RE AMAZING!! Next... Neither PledgeManager nor our Phone Book system thought there would be people as generous as you. So most likely you'll only have one email from PledgeManager (there are some edge cases where you might have been got two PledgeManager emails, but probably not) and one email about your Phone Book entry. We're working on a solution to the Phone Book entries as we speak and will hopefully have that sorted soon. For PledgeManager, we're going to try to go through and find the names of everyone who backed multiple times manually. But since we might miss you, please get in touch (via support@terribletoybox.com) if your PledgeManager account doesn't reflect what you actually bought. We'll sort you out manually. What is Ransome's Swear Jar, what are these tiers and why should we give you money? We're still working out exactly how your name will be getting displayed in the game. If we do figure it out, we'll post to the blog. In the meantime, know that any the money you give us will be used to help make the game better. The swear jar has 3 tiers, $10, $20 and $30. The more you give, the more prominently your name will appear in the swear jar listing & we'll be able to make a better game for you too! I added Ransome's Swear Jar, but my name didn't get linked to the add on OR I added my name, but I need to change it now. How can I do that? As far as we can tell, there isn't a way to change the name associated with your Swear Jar entry. Likewise, if you accidentally added the Swear Jar without a name associated with it, PledgeManager has no way to add one after the fact. The easiest thing for you to do, is "unlock" your order again, remove the Swear Jar from your cart and then add a new Swear Jar to your cart, making sure to put your name in and spell it the way you'd like. Note: you can add more than one Swear Jar to your cart and have different names associated with each entry if you wanted. I saw you giving away T-shirts on Twitter and at GDC! Are these the backer T-shirts? Why are other people getting their shirts and I still haven't got mine? The shirts that Kickstarter Backers will get will be different. And the only way you'll be able to get one of those exclusive shirts is if you're a backer. We won't be giving them away to press or selling them or anything else. We're working on how and when to get the backer shirts out to you sooner without involving a lot of extra postage and so on. We'll let you know when that's getting finalised. Backer T-shirts?! That sounds fun, I want one! If you backed during the Kickstarter, you can upgrade to get a T-shirt via PledgeManager. If you're a new backer, sorry. There'll be other T-shirts you'll be able to buy, but it won't be the backer shirts. I just want a T-shirt, any shirt!! Can I buy one/win one? We'll be periodically doing giveaways via our Twitter account (@thimbleweedpark), so if you're lucky you might win something. 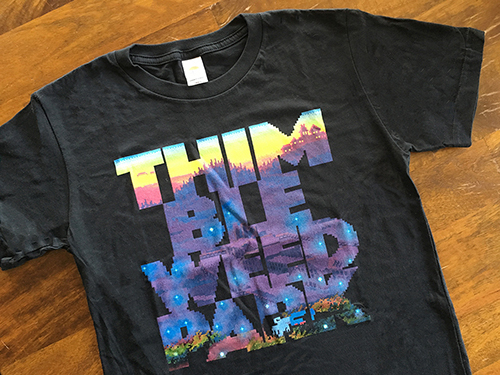 If you'd like a more guaranteed way of getting a shirt... We're going to be selling those same shirts at PAX East. So stop by our booth (number 5169) within the Indie Megabooth to buy one. We're also investigating ways we can set up an online storefront to sell just these shirts, but that'll take time. So patience, please! If you have more questions, ask away! I'm happy to help out. Put your question below if it's a general one and you don't need direct action from us. If you need personalised help, reach out to us (me) at support@terribletoybox.com and we'll do our best to get it all sorted. Please don't post personal requests in the comments. Thank you again for your help, Jenn. :-) I only demanded that you would let me win when we play chess. :P I've worked with customer service so I know how it's like. Maybe Ransome's real name is one of the (male) backers/blog readers? Maybe Ransome used to be a therapist trying to cure people's fear of clowns? Why are you talking to me about Amazon? Cause you're the big chief of Amazon! Ahaha sorry I just wanted to reply to Jenn's primary post. I see. You should talk to Wonder Woman. The "Answers to Unanswered Friday Podcast's Questions" podcast is online! Thank you Jenn for posting a so much exhaustive FAQ!! AhAh, I watched the Inglorios Bastards movie, but it was dubbed in italian, so I didn't get it! Thanks! Eheh, well... as far as I know (and the Real David Fox can confirm), Rube Works is available in App Store / Mac App Store, Google Play, Amazon App Store and Steam. I don't think it's available on Gog. "you can upgrade to get a T-shirt via PledgeManager"... you say. Yet I couldn't find any upgrade that said "backer T-shirt" . The T-shirt is only available for Kickstarter backers. Mostly because there wasn't much interest in it compared with other rewards and we wanted to make things less confusing for all the different pledges available to new people. The shirt definitely won't be in the box. So if you want it and you're a Kickstarter backer, you'll need to choose one of the following bundles (if you can see them): Shirt Bundle (costs the same as the Box Bundle), Signed Poster + Shirt Bundle, Box + Poster + Shirt Bundle or Making of Book Bundle (not the Making of PDF). If you can't see those bundles, or the versions of those bundles that you can see don't include the T-shirt, then you'll have to get one of the non-Backer T-shirts that will be available at some point in the future. Why don't you offer an exclusive (including ks:) shirt to all people who missed the kickstarter, but supported TP before its release. In my opinion, everyone who wears *any* TP t-shirt is one of the very 1st coolest kids far and wide, even with the GDC t-shirt. None the less, the kickstarter backers are those who made this project possible, so there is a good reason for an exclusive kickstarter t-shirt. Hmm I just checked it again and I think I see why I can't see the "backer shirt". Back then I wanted to back the project but wasn't a member/user of kickstarter. I bought the game through Humble Bundle (please click on our highly clickable Humble Bundle PayPal link.). This was somewhere in 2015. Thanks for all this information, also regarding the differences between Kickstarter and all the other backers. About the swear jar: I understand that the phone book is something where you see a huge list of names with their numbers. This is a pretty unobtrusive way of including personal data in the game. I like the idea very much. However, if you promise to display (in whatever way) backer names in a more or less “prominent” way using the swear jar, your game becomes too contemporary, personal or whatever you call it. I would like the swear jar to be something from the background, not in the focus – just like the phone book. The game will become a new classic, so it should be equally good in another 20 years from now. Please have a thought about it. Apart from that, I am eagerly waiting since day one (or three, to be exact…) of the Kickstarter project. Have fun with my 500 bucks; you may spend some on a good beer of your choice. Thanks a lot, guys, for finally making true what Tim had promised/implied. Well, I don't have the slightest idea of how the swear jar is going to work, but if the names will be picked out at random during the gameplay, the probability of picking a particular name could be commensurate with the amount of money the respective guy had pledged for the swear jar. This would be a way of varying the prominence of the names (in a statistical manner), and it could be done in an even more unobtrusive way during the gameplay (in comparison with the phone book) since the character would always pick only a single name out of the jar (or maybe a small handful of names). Well, guys, I trust you in finding a good solution. I share your opinion. I really appreciate everybody who funds the game, but I wouldn't like to feel compelled to pay homage to their names whenever I play through the game. But I also trust the team, as they want to make the game as entertaining as they can. Thank you for your post. I will definitely upgrade during the next days! I wonder, with Ransome's swearing in the game, how are you going to deal with FCC / rating? I realise that Ransome will swear a lot. And since you mentioned that you will use "beeping" I am concerned that Ransome will beep a lot instead of talk. Not that I am especially fond of hearing swear words - my feeling is just that beeping is awkward if it happens more than a few times. It may increase the distance between the player and the game. Similar to a laugh track*, which some people also consider to be quite an awkward thing. Will paying to the swear jar actually fund/help you to find a way to minimize the amount of beeping? Or will you include the option to turn it off? *) What about an optional Ransome-the-clown-insults-the-player-laugh-track? Needless to say i took it apart back then, and it really consisted of a small spinning record. I hope Ransome has one of those creepy things in his repertoire. Hi! Are these free giveaways/contests a Twitter-thing only? Kind of bums me out that by doing so you concurrently promote Twitter as a service. Not a huge fan of it and now it seems to be the only way to actually get ahold of any "leftover" TWP merchandise. I really would like that mouse pad, but then again I couldn't participate in...well anything. I wouldn't say they promote Twitter. They just promote TP on Twitter, which in my opinion is a good idea. I'd also like to get a mouse pad, but I'm not on Twitter either and I don't mind since the chance of winning is probably rather small. A TP merchandising online shop would also be nice (maybe on a limited scale via Amazon or eBay in order to make it easier). ... or a mouse pad offer on PledgeManager. I'm just interested in the pad. I am a Kickstarter backer but cannot find/add the t-shirt on PledgeManager. If you've already confirmed/locked your order, you need to "unlock" (in the bottom right hand corner) and go back in. On the page titled "UPGRADE", you'll see "Your Current Pledge Level". Scroll down there and you'll see the "Shirt Bundle" listed at $150. Good luck! Thanks for backing! Tried it again: unlocked my order and am only presented with options for digital upgrades. What are the available T-shirt sizes? Being 6'5" tall, I need a XXXL. XXL is usually just too short. Available sizes are Women's Small to 2XL; Men's Small to 3XL. So we should be able to get you the 3XL you require. When you have a T-shirt in your PledgeManager order, you'll have to select which size you want from the drop down. It should be a step that you have to take in order to complete your order. The second half is more about palette cycling used back in the days. I learned how it is done, but even with this knowledge i could never do it, not in 1000 years. Just wow. A king of his craft, Mark did an amazing job. Thank you! Consumed like a fine wine, my hunger for 8 bit has been saited. But like all consumers, we will need more! Mark Ferrari's response to all of Ron Gilberts ideas..
Mark Ferrari has a Bitish accent. Who in the end of the 80's had an Amiga, a Deluxe Paint II, and played the colour-cycle feature? I did, it was simply amazing! You could define a subset of colours to cycle at indipendent speed and direction. An image could have a wonderful "animation" by simply cycling some subset of colours. Now I remember that EGA wasn't even the first monitor I played those games on, it was a ambar monochromatic monitor. And I don't have feelings for that monitor. Then I think it is not simply nostalgia, they were good then and they are good now. Thank you, I finally watched it, I couldn't do it from where I work because I think it's filtered somehow. I agree with what he says now that I watched the real video. This was cool! Thanks Mark, and longuist for the tip. The "Find Account" button is not working for me (Chrome or Edge). There might be something else going on for you. Send us an email with your pledge information to support@terribletoybox.com and we'll sort it out for you. @Sushi: did you actually begin to play The Cave as you wrote (if I remember correctly)? If so, which characters did you choose? I have played The Cave one year ago. I had discovered it by reading a post in this blog (shame on me!). My favourite characters are The Twins, The Monk and the Explorer! The Knight, The Twins and The Scientist are my favs. You're pulling my leg, you don't even know the game. I guess he just googled the game and copied the first three names he found in a walk-through. I don't like the Explorer. Under Windows, the character very often makes the system crash. Btw. The Cave 2 will feature The Commander, a great character which will be TOTALly worth it. Anyway, to the cave: I started it a month ago to check if it worked properly (and really loved the comic delivery of the Cave "character") with the Twins, the monk and ... ermm... the tentacle! Actually I don't remember which was my 3rd character. I know already that backers will receive a DRM free version of the game, but – can you already say whether that is the GOG version? We will be on GOG, but I don't know if they will give out keys to give to backers. I need to ask that. Fairly sure GOG will generate free keys for developers to give away as they wish (or so I've heard from other kickstarters in the past). Personally GOG would certainly be the preferred method for DRM-free distribution. First tour of the Cave: complete. Ron, bravo, great storytelling. There is a lot of this un-polite storytelling, yet not the one crude, dystopian, monstrous of today's games and shows which is easier to sell. It's strange to commit such atrocities with the playable characters. Yet, everyone is often ready to commit little atrocities every day. But the possibility of avoiding them, to make things fine, is always next to us. Every day. That's what means to be heroic. So, thank you for this game. We have no way of mass distrubting xbox or iOS game codes. Backing is only for Mac, Windows and Linux. Are backers going to get the game a bit earlier than the official release? On second thought, I assume that the answer is "no", since the online stores would probably be unable or unwilling to allow for it. Well, I'm already a backer anyway, but I think it would have made another case for backing the game. Hi, i backed via the Kickstarter campaign but i cannot upgrade to a T-Shirt via the Pledge Manager. I see only the digital Upgrades (Phonebook and the Clown Thing), but no Option for the Shirt...? What can i do? Just emailed you about this. But in case someone else is having similar issues, will message here too. 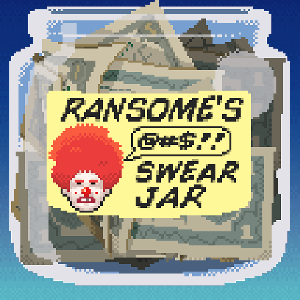 The Phone book and Ransome's Swear Jar are "Add-Ons", as in things that can be added to any pledge level at all. The page BEFORE the Add-Ons is the page that lets you upgrade. At the top of the screen you should see your "current pledge". Scroll down and it should show you the options available to you to upgrade to. Each pledge level should have a description and (if you click) images of all the items you'll receive if you get that pledge level. Im a kickstarter backer. Now i see that pledgemanager asks me to confirm my order. Is it necessary?